Click the ReApply Payment button. In Re-Apply Payment Transaction window, click the Apply to Oldest Fee First or choose a specific fee by clicking in it's Apply Amt column. The Link family has two fees posted to their account - a tuition fee of $65 and a registration fee of $35. Mrs. Link made a payment for the registration fee only, but it was incorrectly linked to the tuition fee. 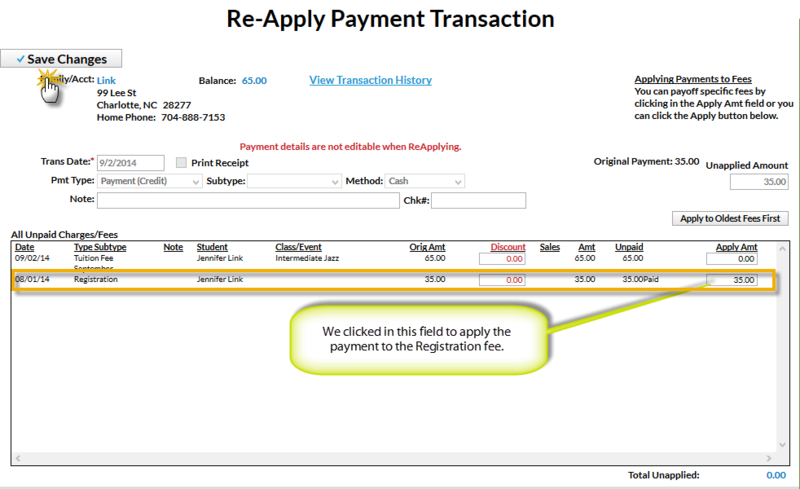 Clicking the Pencil icon on the incorrectly linked payment line opens the Edit Transaction window. Click the UnLink Fee(s) button. You can view the linked fee before unlinking it by the clicking View x linked fee(s) button. In the pop-up box that says, UnLink Payment from all Linked Fees?, click OK; and if prompted, click OK again. The fee is now unlinked and the Edit Transaction window re-opens. Click the ReApply Payment button. The Re-Apply Payment Transaction window opens. Since this payment should have been applied to the Registration fee, we'll click in the Registration Apply Amt field and Save Changes. The payment is now linked to the correct fee.